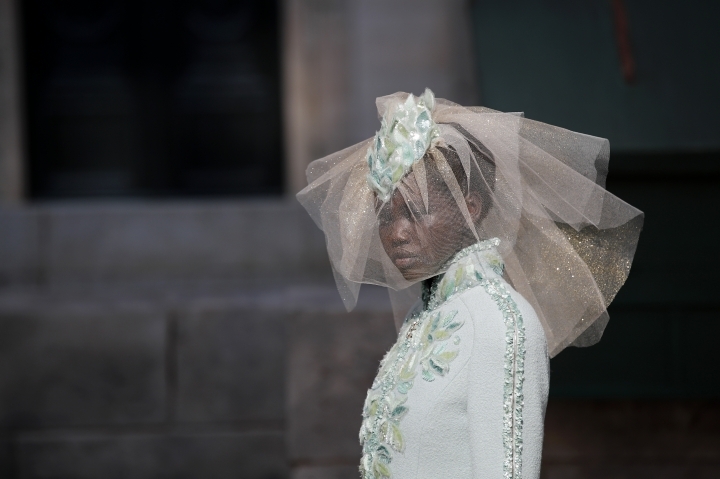 PARIS — Paris — the City of Light, lovelocks and the Seine River— was the backdrop Tuesday in Chanel's sublime couture collection that showed designer Karl Lagerfeld is still at the top of his game at 84. Penelope Cruz, Pharrell Williams and Lily Allen applauded after the cinematic runway display in which the French fashion house painstakingly recreated a Parisian cityscape — all inside the nave of the Grand Palais. No detail was spared: from the padlocks on the famed Pont des Arts bridge to the surrounding riverside booksellers (with Chanel-themed literature), to thick city stones and the majestic domed French Academy. 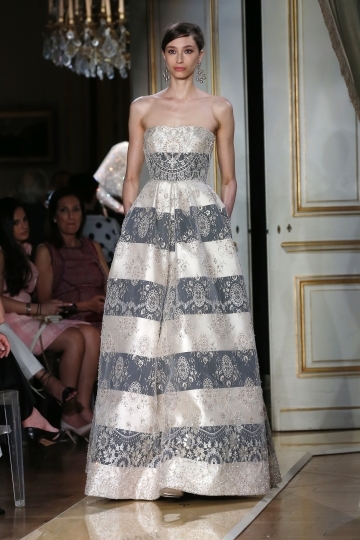 But this fall-winter season, couture was the true star of the show. Here are some highlights from Tuesday's collections. 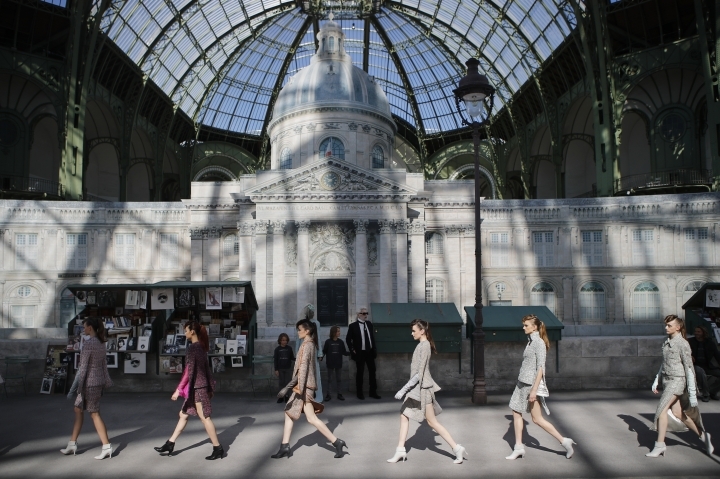 Mirroring the nostalgic Parisian decor, Chanel's 67 accomplished looks came in the colors of the city. Light gray stood for zinc rooftops, almond green for historic building roofs, anthracite for roads and gold and silver — so said the program — for "reflections of the moon in the rippling Seine." Pinks and mauves reflected sunrise; black and deep navy, the night. White and beige captured the French capital's annoyingly changeable weather. But it wasn't just in the color. The myriad interlocking crystal embroideries were said to mirror cobblestones and the netted tulle that was embroidered with gold aimed to capture the lovers' padlocks on the Pont des Arts (that were famously banned by Paris authorities). These poetical explanations were nice but unnecessary for a collection that didn't need any gimmicks to impress. Lagerfeld raised the bar this season — and it was the inspired sleeve silhouette that did it. Sleeves flapped and unfurled in a unique bell shape, which was achieved thanks to an open arm zipper. It possessed a fresh sporty-meets-regal air. The unfurling shape moved down the body into long split skirts that sported open panels at the sides and another skirt underneath. Folded cuff boots furthered this unfurling dynamic. The cuff opened out of the shoe stylishly — in black, white, gray or in iridescent embroidered sequins. British singer Lily Allen, who called Chanel's couture "incredible" and sported new platinum tresses, also spoke about female empowerment to The Associated Press amid the Time's Up and #MeToo movements. The feminist 33-year-old said she has "impostor syndrome" regarding her fame and still finds it "hard to accept" being successful as a woman. She added: "maybe it's a societal thing, or maybe it's something we internalize from a young age." Allen also expressed skepticism about the effectiveness of online pro-women campaigns. "There's 'Instagram empowerment' and it's not really very real ... The more we become so focused on the visual aspect of women, we lose the value of everything else ... it can't be a hashtag thing," she said. "I'd like to see more implementation of change and policy at government level." 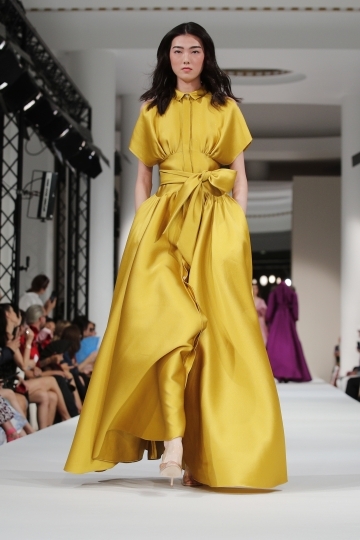 It was a mixed couture bag for Alexis Mabille. The French designer stumbled at the start of his collection with several sheer lace looks that lacked originality. But later into the 47-piece display inside the chic Salle Pleyel concert hall he really found his mojo. 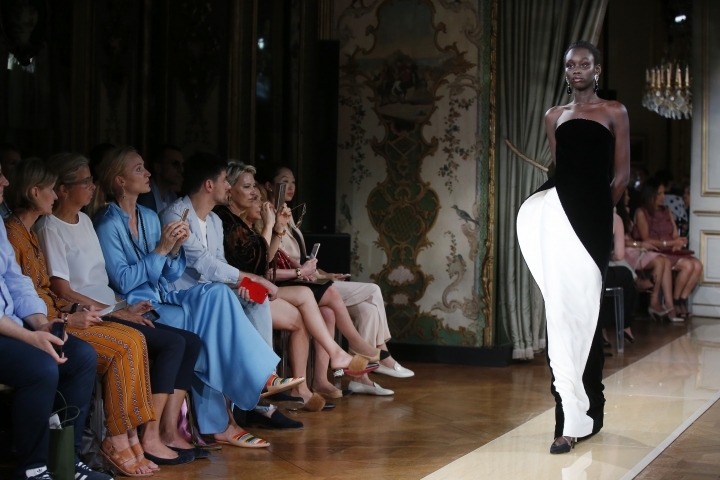 Off-kilter floor-length trapeze gowns with stripes were followed by dresses that opened up or fanned out dramatically at the chest — the focal point of his best designs. A series of tiered tulle gowns with extreme-cinched waists — one in dark vanilla and another where colors subtly blended from azure-white to butter — were the work of a true artist. 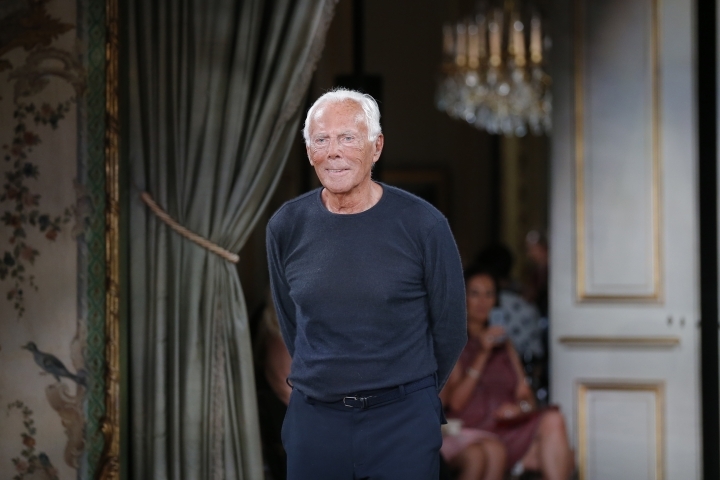 Music icon Tina Turner was among the notables at the Giorgio Armani Prive display inside the resplendent Italian Embassy in Paris' chic Left Bank. The Armani Prive collection called for two shows, each comprising some 96 looks, and were followed by cocktails, making the event a serious contender (along with Chanel) for the most time-consuming one on the couture calendar. 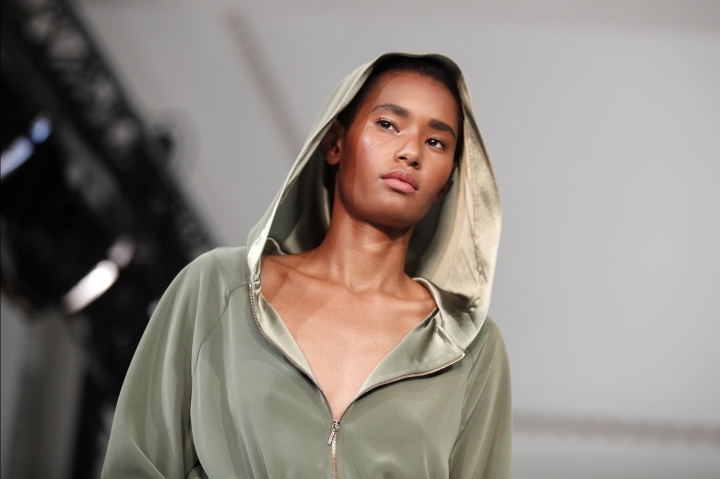 A dominant theme in the varied show was the strong, rounded shoulder. The silhouette appeared on a champagne lame silk crepe pantsuit and a black and white checked jacquard jacket, both designed as daywear. 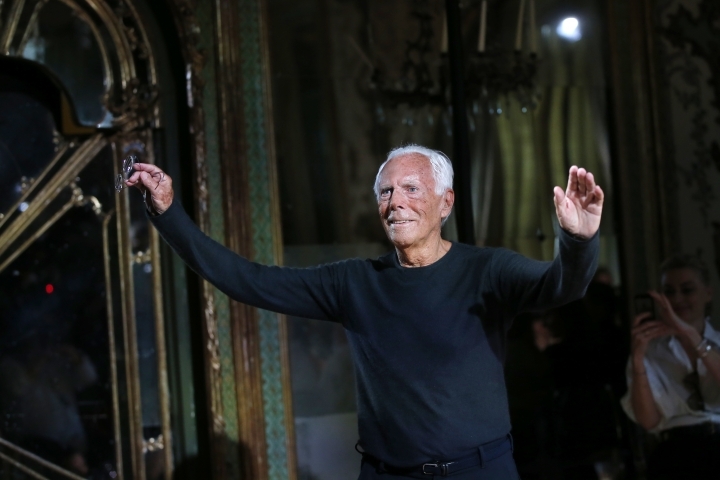 For evening, the gowns dazzled and amused in equal measure — showing that at 83, Giorgio Armani has not lost his humor. A motif of crossed arms in crystal embroidering — perhaps mimicking the fashion press' critical attitude — adorned one black silk velvet dress. 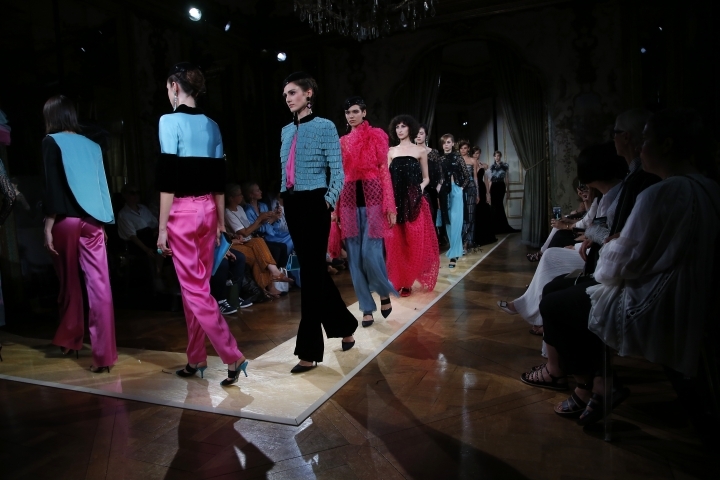 Models poised their arms on a hip, a send up of the embroidery that provoked wry smiles among fashion insiders. 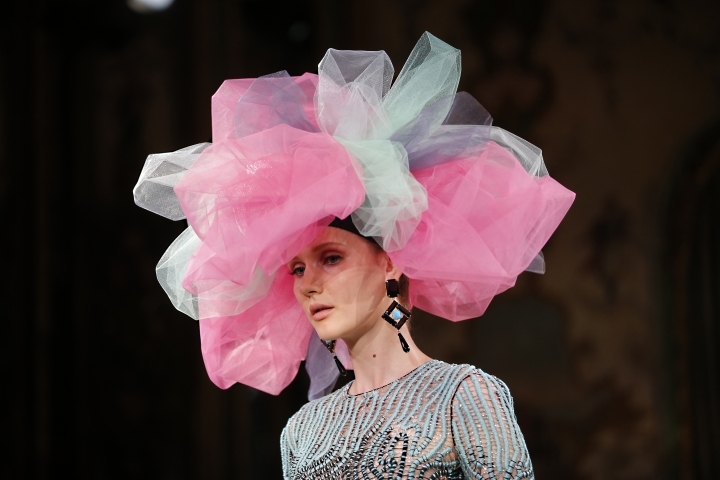 Armani really went over the top toward the end with a 70-centimeter (27.5-inch) headpiece that looked a little like a bath sponge in pink and blue. Sometimes, really, less is more. Chanel has announced that Academy Award-winning actress Penelope Cruz is to become the newest face of the house. The 44-year-old Spanish star stunned in a pale tweed mini dress and a white beret at Chanel's couture show Tuesday. Cruz, who is no stranger to the industry and who has been the face of Spanish brand Loewe, will officially become Chanel fashion ambassador and front the 2018-19 resort collection campaign. The photography was shot by designer Lagerfeld himself. A name that's not often associated with fashion, Monopoly, is being used in an unusual collaboration with Parisian fashion designer Olympia Le-Tan. Hasbro Inc., the makers of the classic board game, teamed up with it-bag designer Le-Tan to produce a collection of clutches that was launched Tuesday evening in Paris. The book-shaped handbags feature logos such as "Get Out of Jail Free" and "Community Chest." "Olympia Le-Tan is known for her irreverent pop culture-inspired designs, and we're thrilled to work with her," Hasbro executive Rachel Clouet said.